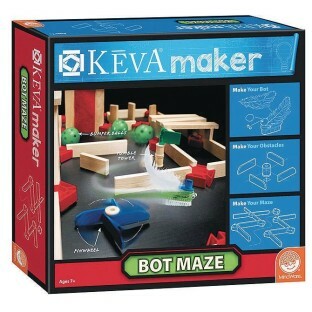 Experiment, innovate, and create with precision-engineered Keva planks and a variety of doodads and gizmos! Customize a pair of motorized bots using crafty items found within this one-of-a-kind kit. The more unique looking, the better! Then construct your maze’s tunnels, doorways, passages, and obstacles from the planks and connectors, or by hacking things you have around the house. The ultimate engineering tool - kids will be in awe as they watch their personalized bot zoom through their handcrafted maze! Creativity is the key to becoming a master maker! Includes 30 Keva planks, 8 Keva half planks, 24 connectors, 2 motorized bots, 6 tumble blocks, 3 bumper balls, 2 Lithium Coin Cell CR2025 3V batterys, and a wide variety of craft materials.